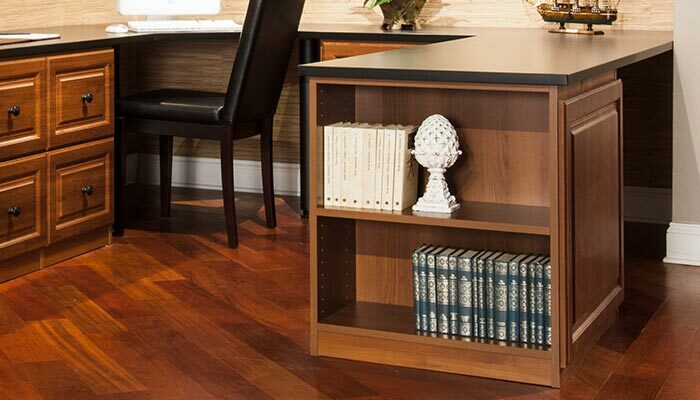 This home office design features traditional cabinetry in a cherry wood tone, but the open floor plan of this office/home is strictly modern. The juxtaposition of traditional and modern elements is a hallmark of this homeowner's personal aesthetic, and is carried throughout the home. Note the way the large built in desk wraps around the wall and includes a highly functional peninsula, allowing the space to be used as a two person office when needed. Many homeowners need more space but cannot add a room onto their home. They may also prefer an open floor plan. This is where Closet Works can help — adding a home office to your home can be done without requiring major construction or a room addition. 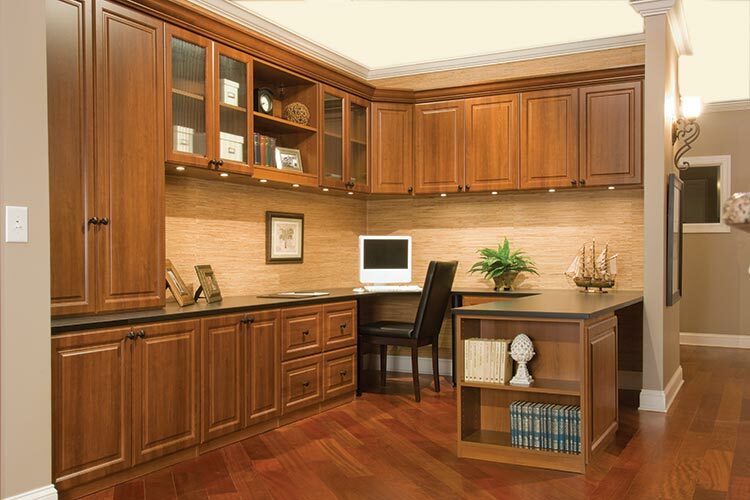 In this example, Closet Works used a work penninsula and custom office storage cabinets to create dedicated, segregated home office space in the under-utilized section of a larger room. The open floor plan was retained, and a quiet corner was set aside for the office. Openess is a theme in this home and the office is no exception. The unobstructed, airy feeling is retained by the use of reeded glass door fronts on four of the upper cabinets. The penninsula is anchored by an island featuring open shelving. It is all accomplished with a very traditional style of cabinetry that compliments the homeowners taste without conflicting with the modern open style of the home. 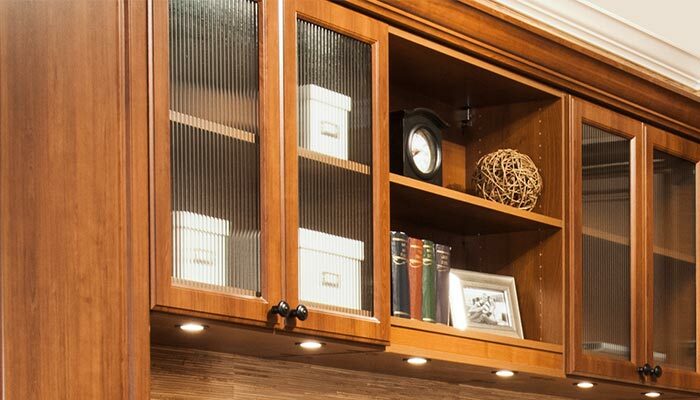 The reeded glass panels used in the home office cabinetry continue the theme of traditional elements integrated into open modern spaces. The end of the penninsula includes integrated bookshelves next to the open area that doubles as a second desk.